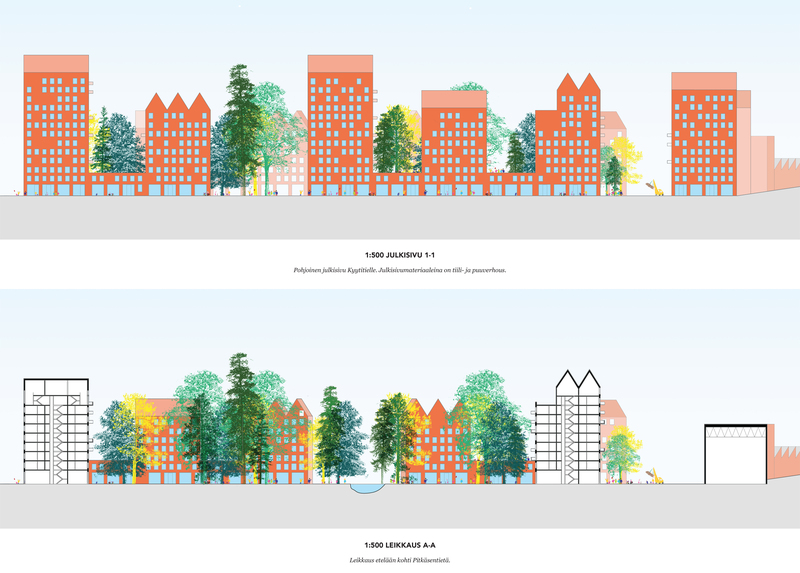 Proposal for the Vantaa Asuntoreformi 2018 Architecture Competition. Our scheme, Tree of Life! was awarded an Honourable Mention (3rd Prize) at the 14th International Alvar Aalto Symposium. The Jury praised the project as “a manifesto of man and nature living together, symbiosis, its aim is to create a community-minded and self-sufficient piece of city with a small carbon footprint. 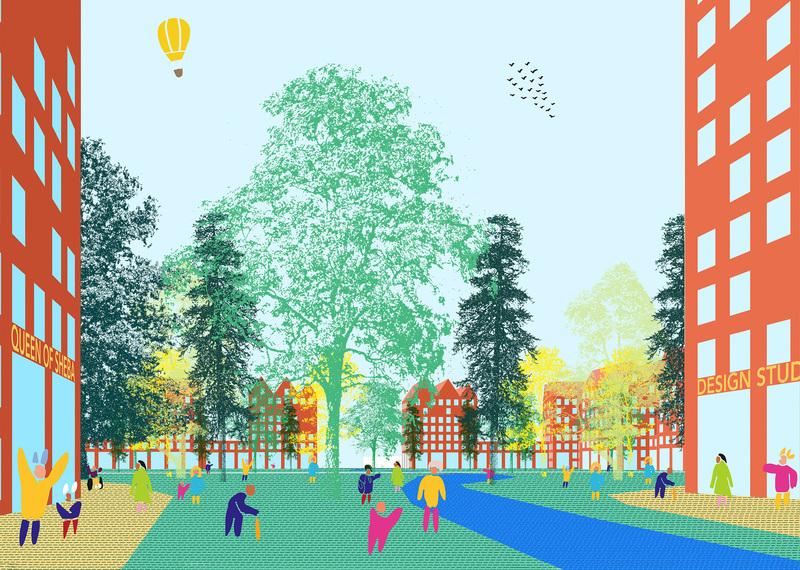 The plan is a charming scenario of nature empowering urban space and urban space protecting nature”. Tree of Life! is an ambitious proposal which aims to create a socially and environmentally conscious piece of built environment in Hakunila. The proposal consists of a “Super-Courtyard”, which encloses a 3-hectare “Urban Forest” and an adjacent “Industry Street”. 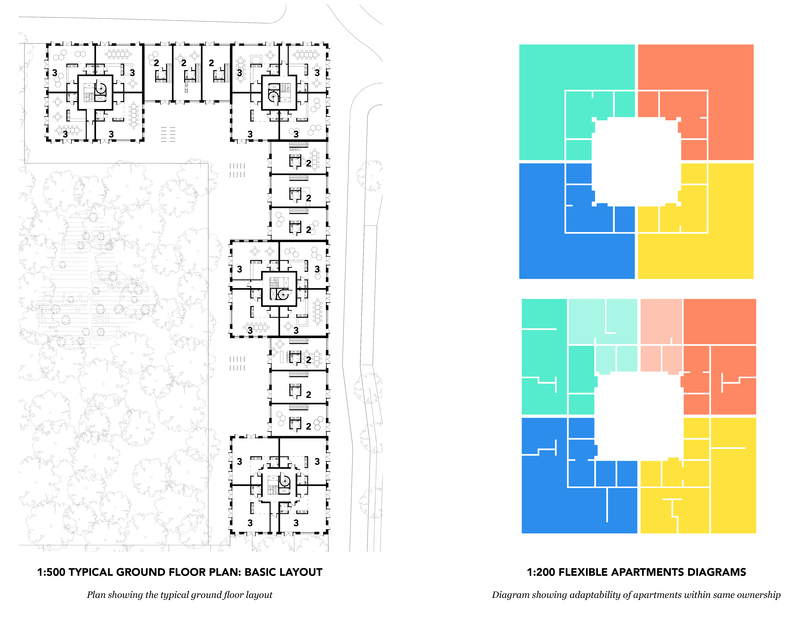 The buildings which comprise the “Super-Courtyard” and “Industry Street” contain flexible housing (81513m2), ground floor live-work units (duplex, 3680m2), rentable retail units (7600m2), a nursery school (800m2) and a CLT manufacturing plant, timber workshop and education facility (2500m2). Pedestrian routes are provided to both the North-South axis and the East-west axis through the Urban Forest. Vehicle and pedestrian routes are provided surrounding the courtyard. The entire development is to be constructed from CLT, an industry which has great potential in Finland but which is presently under-developed. The buildings vary between 2 and 13 storeys and use a maximum span of 4m to allow construction using CLT panels. 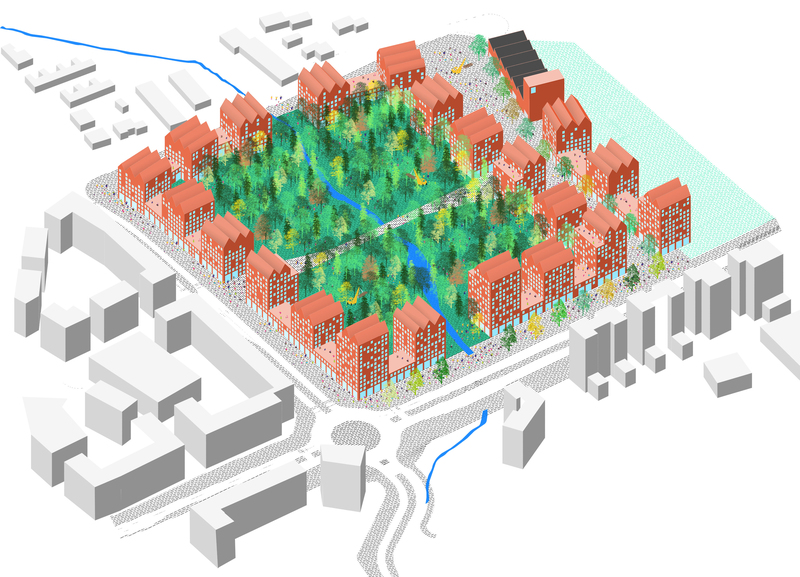 The project proposes a mutually beneficial architecture and landscape strategy in which the “Urban Forest” is sustainably managed using principles of Continuous Cover Forestry to provide construction material for modifications to the surrounding housing and live/work units. The Urban Forest will primarily consist of a complimentary mix of tree species which are ‘thinned’ every 5 years to harvest viable, construction grade timber whilst maintaining a forest which is an attractive and usable social space for the people of Hakunila. 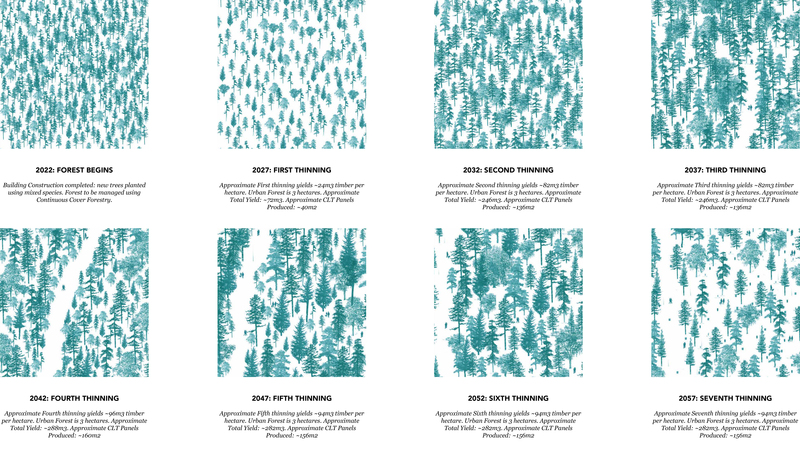 These thinning cycles will produce timber which can be manufactured into large-scale CLT or Brettstapel panels at the onsite manufacturing and education facility at a rate of approximately 160m2 of panels per 5 years. 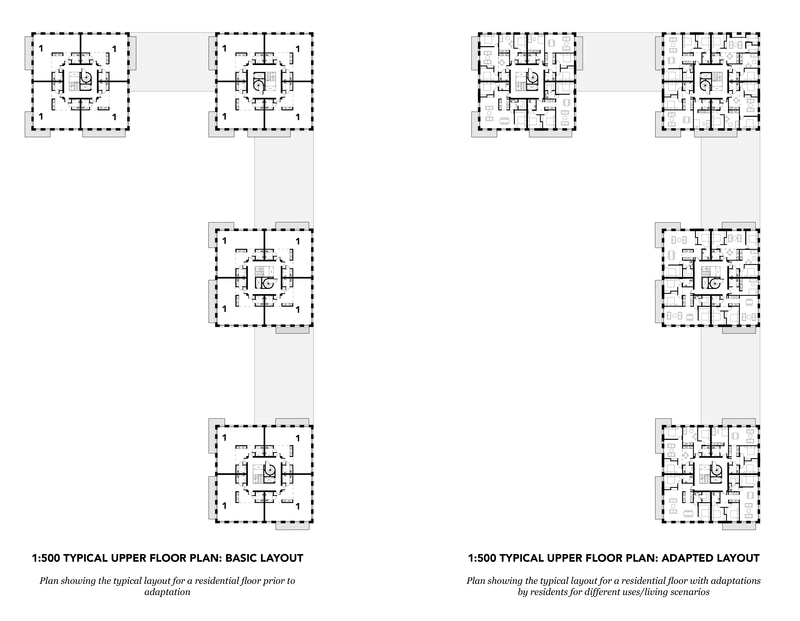 These panels can be used to modify the flexible housing for the needs of the residents at a rate of approximately 10-20 internal restructuring modifications per 5 year thinning cycle. The “Urban Forest” also acts as an important social space for interaction between people of different generations and cultures. For example, an elderly resident might pass on knowledge about mushroom collection or fishing to a younger resident, whilst the youngest can enjoy climbing trees and discovering nature. The Urban-Forest is considered an important community resource which can provide education, enjoyment and interaction. It is proposed that the forest also contain rentable-allotments, the like of which is already common in north Helsinki and Vantaa. Forests provide both mental and physical health benefits and the scheme would fully engage with these. The daycare centre would also be able to use the forest. 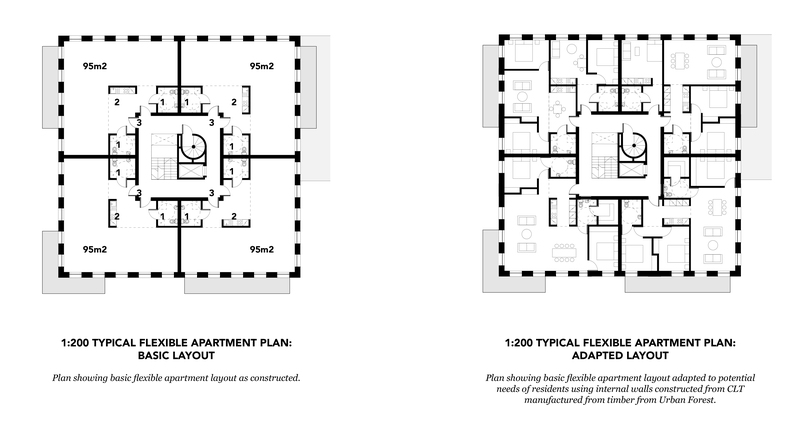 The flexible housing has been designed to provide opportunities for people to live in different ways over time. Each apartment has two possible entrance points, two set bathroom locations and a set kitchen location, which can be adapted for use in different ways. For example, initially a resident with two children may wish to configure the space as a single dwelling with three bedrooms, one an ensuite master bedroom. As the children grow up it may be that one of them wishes to have their own space as a young adult, the space could then be reconfigured using simple CLT internal panels which could make the space into a two-bedroom dwelling and an entirely separate single bedroom apartment. Alternatively, the same modification could allow for an elderly relative to move into the secondary apartment to be close to family for care, whilst maintaining privacy. This would enable the building to actively adapt to the residents over time, and be an economically viable way of provided family care to elderly and a first home to the young, without paying for a new home, or a care home. Two-storey Live/work units are proposed to line the street edges to create active street frontages and encourage entrepreneurship. In an area which is home to such varied cultures this opportunity could create a truly varied and rich cityscape containing, for example, restaurants and cafes serving food from different cultures, artists and services, such as hairdressers and accountants, to ice-cream makers, and even a renewed manufacturing industry which could benefit from the proximity to Vantaa Airport. Entrepreneurship is becoming an increasingly viable option in Finland and Vantaa’s strong travel links and the proposed increase of housing in the wider area make it a desirable place to start a business. Active streets will make the development an exciting place to visit. The live/work units are also designed to be highly flexible depending on the type of business or living arrangement. The CLT manufacturing facility would also contain a higher education and training facility which would provide skills in forestry, timber manufacture and joinery to people in Vantaa. It is envisaged the scheme will be car free, with residents encouraged to use public transport and bicycles for everyday transport, and a car-share scheme proposed as part of the development for when longer journeys, for example holidays, are required. 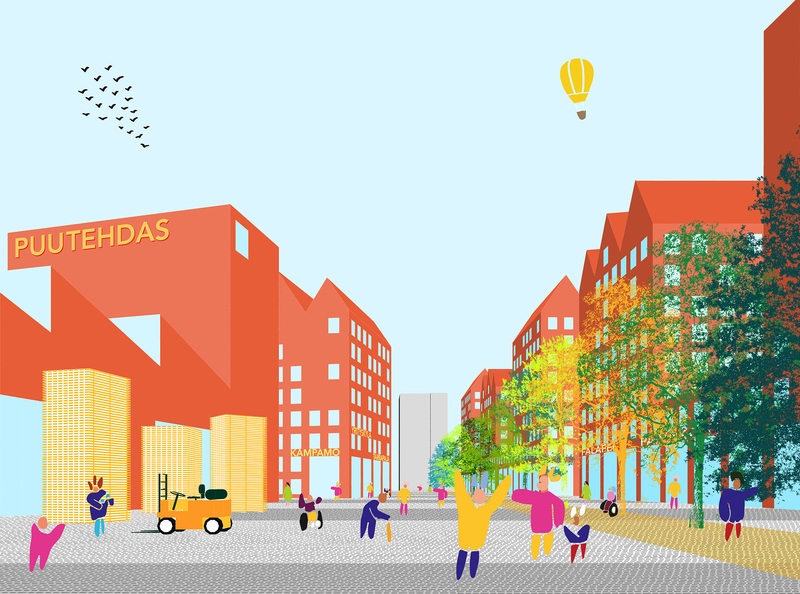 This scheme is an ambitious vision of a possible future for Hakunila and could provide the basis for a series of future developments within Vantaa which include strong urban edges to create active streets, whilst enclosing generous park and forest spaces.